An interactive audio-visual installation that invited exploration of the natural world and its vulnerability to destructive forces. An organically evolving experience, shifting between the familiar and the abstract, images and sounds from the environment were made malleable and open to the transformative involvement of the visitor. 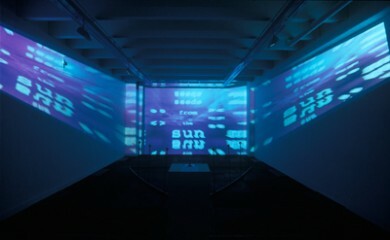 Computer technology was employed to extend the known and the familiar into a metaphysical fantastic other–a labyrinth of physical and aural experience. Elastic Horizon was the creation of Antonio Funiciello (Venezuela) and Lissa Meridan (Victoria University of Wellington School of Music).